Biángbiáng noodles (simplified Chinese: 面; traditional Chinese: 麵; pinyin: biángbiángmiàn), also known as (油泼扯面; 油潑扯麵; yóupō chěmiàn), are a type of noodle popular in China's Shaanxi province. 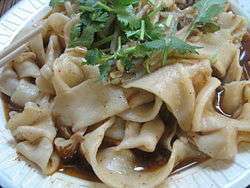 The noodles, touted as one of the "ten strange wonders of Shaanxi" (陕西十大怪), are described as being like a belt, owing to their thickness and length. The noodle is broad and hand-made. It was originally part of a poor man's meal in the countryside, but has recently become popular in fashionable restaurants due to the unique character used in its name. Dishes with this noodle are often topped with lots of red hot peppers for the cold winter in Shaanxi. Look up ⿺辶⿳穴⿲月⿱⿲幺言幺⿲長馬長刂心 in Wiktionary, the free dictionary. The character for biáng in calligraphic regular script. The character for biáng in a Song font. The simplified character for biáng in a Song font. Made up of 58 strokes in its traditional form (43 in simplified Chinese), the Chinese character for "biáng" is one of the most complex Chinese characters in contemporary usage, although the character is not found in modern dictionaries or even in the Kangxi dictionary. The character is composed of 言 (speak; 7 strokes) in the middle flanked by 幺 (tiny; 2×3 strokes) on both sides. Below it, 馬 (horse; 10 strokes) is similarly flanked by 長 (grow; 2×8 strokes). This central block itself is surrounded by 月 (moon; 4 strokes) to the left, 心 (heart; 4 strokes) below, and刂 (knife; 2 strokes) to the right. These in turn are surrounded by a second layer of characters, namely 穴 (cave; 5 strokes) on the top and 辶 (walk; 4 strokes) curving around the left and bottom. The Chinese character for "biáng" cannot be entered into computers. Therefore, phonetic substitutes like 彪彪面 (biāobiāomiàn) or 冰冰面 (bīngbīngmiàn) are often used. The character has not been added to Unicode yet, but the traditional and simplified forms are being considered by the IRG for inclusion in a future CJK Unified Ideographs extension. There are a number of mnemonics used by Shaanxi residents to aid recall of how the character is written. 黃河兩道彎 黄河两道弯 Huáng Hé liǎng dào wān Over Two bends by Yellow River's side. 言字往進走 言字往进走 Yán zì wǎng jìn zǒu "Speech" (言) enters inside. 當中加個馬大王 当中加个马大王 Dāngzhōng jiā gè mǎ dàwáng Inside, a horse (馬) king will rule. 坐著車車逛咸陽 坐着车车逛咸阳 Zuòzhe chēchē guàng Xiányáng On our carriage, to Xianyang we'll ride (radical: 辶 'walk'). Note that the first two lines probably refer to the character 宀 (roof), building it up systematically as a point and a line (river) with two bends. 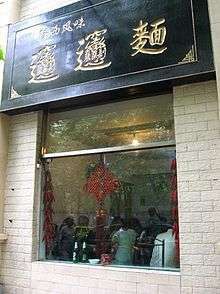 A Xi'an biang biang mian restaurant. The origins of the biang biang noodles and the character biáng are unclear. In one version of the story, the character biáng was invented by the Qin Dynasty Premier Li Si. However, since the character is not found in the Kangxi Dictionary, it may have been created much later than the time of Li Si. Similar characters were found used by Tiandihui. In the 2007 season of the TVB show The Web (一網打盡), the show's producers tried to find the origin of the character by contacting university professors, but they could not verify the Li Si story or the origin of the character. It was concluded that the character was invented by the noodle store. One theory is that there was no such character or meaning for this word in the beginning, and the word actually came from the sound people make from chewing such delicious noodles, "biang biang biang". A legend about a student fabricating a character for the noodle to get out of a biang biang noodle bill also is a commonly believed theory about the origin of the character. According to an article on China Daily, the word "biang" actually refers to the sound made by the chef when he creates the noodles by pulling the dough and slapping it on the table. ↑ "What is the Most Complex Chinese Character?". Mental Floss. Retrieved 2016-06-14. 1 2 See Unicode Technical Report #45 and associated data File, UTC-00791. The file references this Wikipedia article as a primary source and a reason for inclusion. ↑ Beck, Stewart Lee. "The Hardest Chinese Character". Retrieved 2016-06-14. 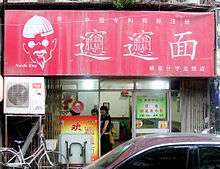 ↑ "China Daily: Biangbiang Shaanxi street food". Retrieved 19 November 2012.